Dr. Bimal Patel is Visiting Senior Fellow at IDFC Institute. He is an architect, urban designer, urban planner and academic who has criss-crossed disciplinary and professional boundaries to find ways in which architecture, urban design and urban planning can be used to enrich the lives of people living in India’s cities. He studied at the University of California Berkeley, from where he received a PhD in City and Regional Planning, and a dual Masters degree in Architecture and City Planning. His undergraduate education was at the School of Architecture CEPT in Ahmedabad from where he earned a Diploma in Architecture. Bimal heads HCP, which was founded in 1960 by his father, architect Hasmukh C. Patel. HCP is a multi-disciplinary design, planning and management practice based in Ahmedabad. There, Bimal has led work on a wide range of residential, institutional, commercial, housing, industrial, urban design and urban planning projects across India and outside the country. Bimal also founded Environmental Planning Collaborative (EPC), a not for-profit consultancy, policy research and advocacy organisation. EPC’s innovative approach and nationally recognised work have transformed planning and urban design in Gujarat. For the last seven years, Bimal has been President of CEPT University. At CEPT University, he has led a comprehensive re-imagination, rejuvenation and modernisation of this fifty-year-old institution’s pedagogy, research focus, institutional organization, governance and infrastructure. Bimal's research focuses on architecture and urban planning history, land use planning, real estate markets, building regulations and land management. 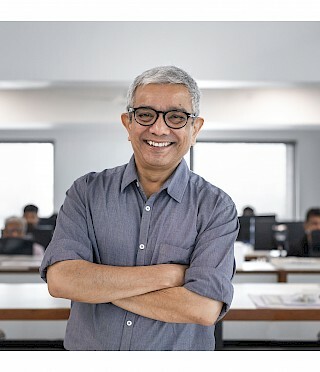 His work has been recognised internationally and he has won numerous awards including the Aga Khan Award for Architecture (1992), World Architecture Award (1997), Prime Minister’s National Award for Excellence in Urban Planning and Design (2003) and the HUDCO Design Award (2013). In 2019 he was awarded the Padma Shri one of India’s highest civilian honours.